I started playing guitar in 1990 after being inspired by Jimi Hendrix. Other influences were Eric Clapton, Stevie Ray Vaughan, Carlos Santana, Roy Buchanan and others. I played in several bands in the Philadelphia area including "D's Escape" and "Saucy Jack" and performed in respected venues such as the Hard Rock Cafe in Philadelphia and Grape Street Manayunk. I've also studied with some of the top guitarists in the world including Stefan Grossman, Rusty Cooley, Jimmy Bruno, Silvio Gazquez, Derryl Gabel, Sol Philcox, Jimmy Dillon, and others. My first guitar course is Killer Guitar Control Secrets. This teaches the improvisational essense of these traditional guitar masters. 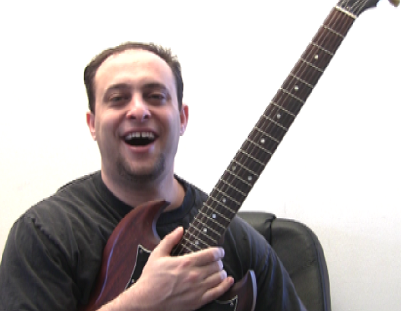 I also created The Ultimate Beginner Guitar Course, How to Play Smokin Blues Guitar, Killer Lead Guitar Made Simple and other guitar learning products. My goal is to make sure you, the customer, are happy and satisfied with our products and services, and to correct any problems you might have.